The concept of dispersing bugs by air is not new. In the past, trichogramma parasitoid wasps were released via light aircraft over Pecan farms in Northern NSW. Persimilis in the US have also been released with light aircraft. Means of dispersal this way is obviously limited by aircraft access and underlying costs associated with distributions. 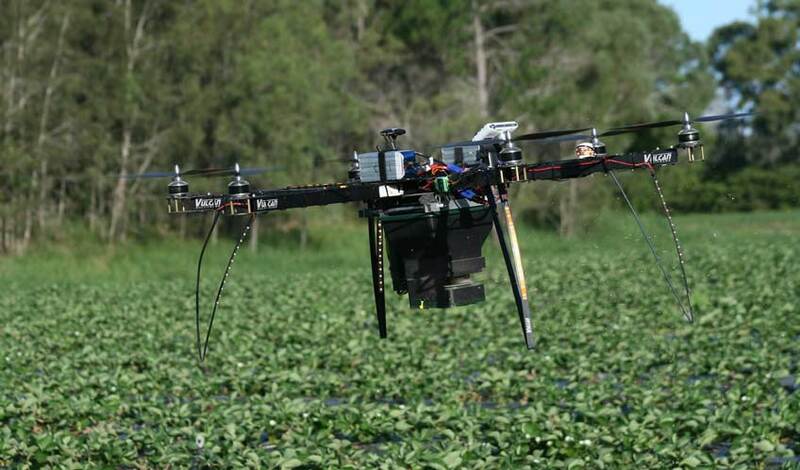 The development of Unmanned aerial vehicles (uav), has opened a new concept of releasing beneficial insects onto blocks in a much cheaper and efficient manner of pest control. Over the last 12 months Nathan Roy has embarked on a project on behalf of Biomites in developing UAV designed to spread beneficial insects. Current and future farming is and will rely more of pest biocontrol using beneficial arthropods (insects and mites). Crops such as corn/ tomatoes will use up to 3-5 different arthropod biocontrol agents. As most beneficial insects disperse via flight or air streams, it seems to be a logical step to develop a means of spreading beneficials via uav. For persimilis, a very mobile predatory mite, once they have exhausted their prey source of Tsm they either run between plants or move to the extreme points of plants allowing air currents to move them to other Tsm hosts. Uav release simulates natural dispersal. Most farms are now familiar with releasing predatory mites. In Qld, most releases have involved bean leaf dispersal throughout the blocks. In Stanthorpe and Southern states the persimilis is released in pure form, mixed in vermiculite. Releasing is not a difficult process, however relies on manual labour to release into blocks. Uav releases will eliminate the need manual predator releases. A project undertaken by Biomites and Aerobugs sought to look at dispersing persimilis via the UAV. Seek to determine the effectiveness of uav dispersed persimilis in controlling TSM. Compare the results of manual releases to uav releases of persimilis. Read the full article here called the Berry Bulletin.